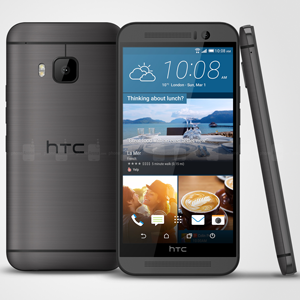 Code-named Hima, the HTC One (M9) was announced on March 1, 2015, as a successor to the HTC One M8. It retains much of the exterior styling of the M8, while making significant improvements on the internals. It's powered by a 64-bit 2GHz octa-core Qualcomm Snapdragon 810 processor and 3GB of RAM. It features a 5" SuperLCD3 1920 x 1080 display, 32GB internal storage, with up to 128GB available via microSD, and a 2840mAh battery, which features fast-charging technology. The M9 rear shooter has a 20.7MP sensor, with dual flash and 4K video at 30fps. The front facing camera features the main camera taken from the HTC One M8, giving it a 4UP sensor, with HDR and 1080p video.